My Subscription Addiction has all the spoilers for October listed! There are somethings I really hope I get this month! I'm hoping for Pure Brazilian Leave In Miracle and I can always use Lauder serum. I think my ideal bag would look something like this. However this month has a lot of good products I wouldn't mind getting. The Kat Von D eyeliner is one of my favorite products and I can always use brushes! The concealer and foundations interest me as well but I doubt they are light enough for me. My skin tone is also very neutral so anything with a harsh yellow or pink cast looks awful. I do really well with BB creams that people describe as having a gray cast though. theBalm Cosmetics Hot Mama Blush- I know these are tiny but I love theBalm blushes and they are perfect for travel. I have a travel blush brush that works great with these! TATCHA PURE One Step Camellia Cleansing Oil- Simply because I know I will get one skin product and this one interests me the most. I've tried samples of it before and it's not bad. I would like to have it for winter. Its a 10 Haircare Miracle Leave-in Product- I'm running out of hair product and I've never tried this. Though I think most other people have due to subscription boxes. A nail polish- I would be happy with any of them this month. I don't have a good white polish yet and I really need one, purple is one of my favorites, and the chrome looks beautiful and I have nothing like it! Either the noyah or the Cosmoholic lip product - I love lip products. Both of the colors for the noyah lipstick are interesting. It's either purple or lavender and I love purple lip products but have very few. The Cosmoholic is in a color that I wear often and it's a liquid which is my favorite! New link includes the bag design for the month. I think it's super cute! As a Halloween fanatic (it's my favorite holiday) I'm in love with the bag! I'm so happy they did this. I love anything with a witch on it! I wish they would do this for more holidays but I can hear the complaints already. I know not everyone celebrates certain holidays or likes them for their own reasons but I think the majority would welcome it! You can't please everybody. At the very least they can do a bag with leaves for fall and snowmen for winter. I like the bag design too. I think it's fun for October. It's not a bag I would go out and buy so it's nice to get a bag that is a Halloween themed just for fun. I love the bag!! I broke down and subbed again for the bag and hoping I get something good lol. The bag is super cute! I love that they kept the colors neutral even though the design is so cutesy. The product selection looks promising - I think there are more products I'd be happy to get than ones I'd be disappointed with. When I saw the spoilers I was like YES tatcha and YES that chrome polish. If I get those two I'll be so happy. I'm almost tempted to sign up for a second bag in hopes that one or both will end up with those items. But knowing my luck, I'll get neither and be stuck with a bunch of swap fodder. Here is a picture of the bag to save you a click. I don't sub to ipsy anymore, but this bag is so cute!! Ipsy website says I will find out tomorrow what will be in my bag, I can't wait!! Me too. I want a couple items so bad but I know that I won't get my hopes up too high since Ipsy sends me some decent items. Please no hair products or black eyeliner. 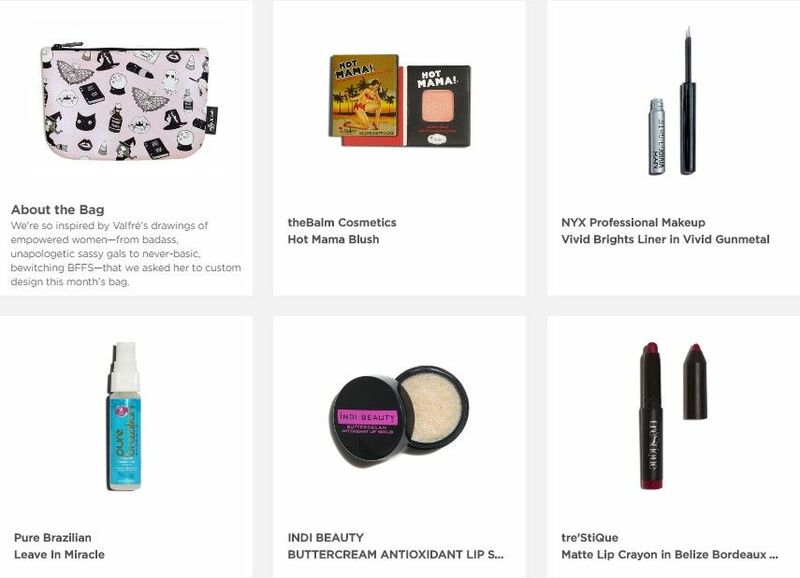 I know the Ipsy fairy is here reading this and these items will magically appear on my page tomorrow. But the bag is super cute. Here is what I will be getting in my bag. I'm not too thrilled with the silver liner but I think my sister-in-law might like it. Everything else I think I will love! This is the fourth month in a row I've received some time of primer product. Can a girl get a break and try something new, please? I already have the lip balm from Allure, since they seem to send a purlisse item every month (ha!). And I didn't get two if the items I was most hoping for....sad. Oh well I'll use most of this bag. But I have such product envy! As of right now, I'm super disappointed in most of my bag. I love the bag design, though. theBalm Hot Mama Blush - Blushes are my second least used products ever. Also, impossible to get a blush brush in a theBalm sample. Trust Fund Beauty Primer - Primer would be my first least used products ever. Pure Brazilian Leave in Miracle - Will use. Overloaded on hair stuff though. Indi Beauty Lip Exfoliator - Might use. I never really exfoliate my lips. Tre'stique Matte Lip Crayon - Lippies are my favorite things and Tre'stique is nice. 1/5 with possible 3/5. I really wanted that chrome polish and silver liner..
@@Bizgirlva, I'd die to get a primer!! I never get them. I'm getting a NYX eyeliner, which I hate NYX products in general, I don't understand the hype. Eyeshadow that's a pretty shade, but already have a dozen like it, blush that I've gotten before, a brush, the one thing I'll actually like and a hair product. I hate getting hair products in beauty boxes they almost never work for my hair. Tatcha cleansing oil- most excited for this!! I wish I would have gotten any of the nail polishes! If I can cash in my points, next month will be my last bag. I've had Ipsy for two and a half years. I finally got off the wait list for Sephora Play and I think it'll be more exciting products. Like most of the others I'm a bit disappointed. I only ended up with one of the items I really wanted. Honestly it's better than none but I had my hopes set high for at least two lol. It's not an awful bag though. Ciate London Fierce Flicks Eyeliner- I'm always happy with liquid eyeliner and I haven't tried this one so I'm happy! Even though it wasn't on my dream bag list it's a staple product that has to be replaced quite frequently. Makeup Forever Ultra HD Invisible Cover Foundation- I've sampled this before from Sephora a few years ago and it did not hold up well on me (but it was summer in the South). I'm also not sure if this is going to match my skin even if they send me the Ivory. My Color IQ is 1Y02 and doesn't have a match in this foundation. If the color isn't off it's probably usable for winter months. Kokie Nail Polish in Heavenly- I honestly thought this was white (my monitor needs adjusting). The only thing from my dream bag I received. It's fine that it's lilac because I gravitate towards purple nail polish anyways. tre'StiQue Matte Lip Crayon- I get things from this brand quite often. It's alright but not particularly exciting to me. I honestly really wanted that purple lipstick from noyah instead. Global Beauty Care Deep Sea Wash Off Mask- This would be fine but I received it on my second account (which is now my Mothers) in August. I do love mud masks but something else would have been preferred. My Mothers bag is making me cringe. I feel like she will only use one or two items from it. Beaute Basics Satin Taupe Eyeshadow- I think she will love this! It's definitely something she would pick up when we go shopping. theBalm Cosmetics Cabana Boy Blush- She loves blush but I think the Hot Mama would have been better this looks really pink. I can also see her struggling to use it because of how tiny it is. essence cosmetics superfine eyeliner pen waterproof- She doesn't use liquid eyeliner. I will try to swap her for this. Lovely Sarah Jessica Parker Fragrance Rollerball- We are migraine sufferers so we generally don't like fragrance. This is the worst possible item either of us could have gotten. Honestly it's probably going in the trash. Adesse New York Liquid Chrome Organic Infused Nail Lacquer in Grand Central- This is so not her thing but I'm eager to swap her for it! First bag: Tatcha oil, terse red lip, Coats liquid liner, SJP rollerball and MeMeMe blush brush. Second bag: Tatcha oil, Chrome type nail polish, Hot Mama blush, Treseq lipstick and patchology eye patches. Overall very happy with both. Most excited over brush, polish and Tatcha. Pretty ok bag for me this month. I'm glad that they got an artist (Valfré) to design the bag, I hope to see more artists in the future!